Joseph Harris Jr. from Boston, Mass., was a prolific inventor from the middle of XIX century. In 1861 he patented (US patent 31016) a simple adding device, somewhat similar to the earlier devices of Jabez Burns and John Ballou, and an inspiration for the later adding machine of Milton Jeffers. 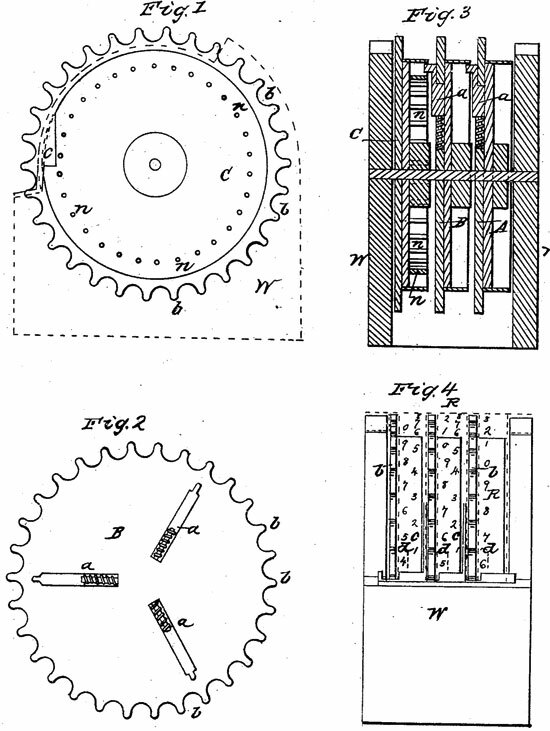 The device (see the lower patent drawing, unfortunately even the patent model didn't survive to our time) consisted of series of revolving wheels provided with pins and spring escapements, acting together in connection with an inclined plane. In order to avoid unnecessary prolixity, the patent drawing presents only three revolving wheels, designated for units (the right-hand wheel), tens (the middle) and hundreds. The tens carry mechanism is implemented by means of the springs (marked with a, a, ...), each placed half way in the interval between the 0 and 1 on the graduated index of wheels. When a spring comes in contact with an inclined plane (C), it is compressed so that instead of continuing to traverse a circumference outside the pins (n, n, ...), it pushes a tens pin (n) one graduation ahead. We know almost nothing about the inventor—Joseph Harris Jr. from Boston, Mass. He was born in 1821 in Maine, Mass. He was a holder of quite a few patents for various devices—a gudgeon (US patent 5452 from 1848), mode of converting reciprocating into a rotary motion (US patent 7902 form 1850), driving circular saw (1853), lamp extinguisher (US patent 11524 from 1854), hand stamp (US patent 13308 from 1855), carpet cleaner (US patent 19465 from 1858), railway car (US patent 29882 from 1960), wheel for vehicles (US patent 272133 from 1883), tire heating furnace (US patent 350131 from 1886), car wheel (US patent 469919 from 1892).